The essential Whisky glass for quintessential taste. You haven't tasted Whisky till you've experienced Glencairn crystal. Considered the "Official Whisky Glass" by the experts, the Glencairn glass is custom-shaped to express Whisky's truest flavors and aromas. The wide bowl makes it perfect for serving with ice or mix, or if you prefer, neat and clean. Personalize with 1 letter of your choice. Etched with the Canadian maple leaf on the bottom. Machine-made of lead-free crystal. Dishwasher safe. Can one use this for bourbon? BEST ANSWER: Yes! It is a beautiful glass that can be used for any straight alcohol drink. I use it to serve neat, up, or on ice. Even sipping tequila! We and all our guests love them. Excellent price for a great gift. The Personalized Glencairn Wide-Bowl Whisky Glasses (Set of 4) can be used with bourbon. They will work with American Whiskey to help improve the aroma and taste. This lovely glass is to be used for any beverage you think of as precious! Yes works very well use them regularly for bourbon and scotch neat. Yes! They make perfect sippers for fine bourbon! That's our plan! Beautiful Christmas gift! Yes. Can be used for any neat liquor. Is the glass wide enough to allow for a 2.36" diameter ice sphere from a Wintersmiths mold? BEST ANSWER: No, but if you’ll run a little water over the sphere to melt some away you’ll still have a nice large sphere for your glass—and these glasses are REALLY nice. I especially like them engraved. The Personalized Glencairn Wide-Bowl Whisky Glasses (Set of 4) has a 2 1/2 inch mouth and is wide enough to accommodate the ice sphere. The diameter of the top opening is 2.5" and it necks down very slightly so it should fit. Can we get different engravings on each glass? If not, can we purchase the glasses not engraved? BEST ANSWER: It doesn't appear that you can choose different engravings. You can try to leave the elections blank to get no engraving or look for a version of the glass with no choice for engraving, they do sell them. I got mine engraved, they look great. Just put your last name. 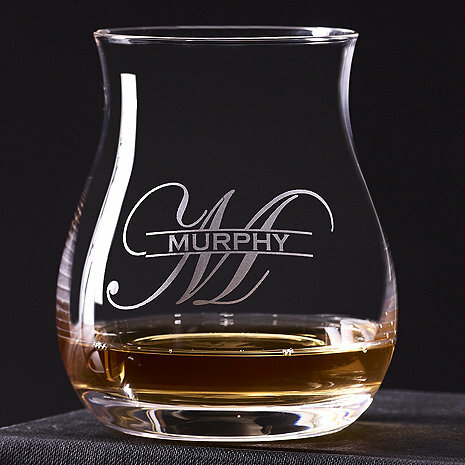 The Personalized Glencairn Wide-Bowl Whisky Glasses (Set of 4) are available without personalization. item number 781 11 04. I suggest calling our sales department at 800.356.8466 and they can assist you with your question regarding different engravings. Thank you. Are they Chinese made ? These turned out to be everything I expected. They arrived sooner than anticipated and were perfectly engraved. They enhance the pleasure, the aroma of my single malt. I am so pleased that I ordered a set for my son. I’m seldom this pleased with internet orders. I highly recommend these glasses. Great glasses (I use them for my 15 - 18 y/o single malt scotch). Every one who sees them asks about where I GOT THEM! Fabulous glasses at a fantastic price. I love to give them as gifts and serve straight, up, or on the rocks drinks. Recommend them highly. Glasses were exactly as described. Engraving was perfect. These glasses add a touch of class when sharing whiskey and bourbon with friends. My husband loves these glasses for his scotch. He likes it just over ice and these are a great shape and the perfect size, even for a double. I would recommend this to everyone and actually I plan to order another type for a thank you gift and will continue to do so in the future if they do not break easily. My husband was delighted. We really liked the glasses. The personalization is perfect and the glassware is very fine quality. I had some difficulty placing the order but when I got the right person it went smoothly. Our whiskey/ bourbon glasses our so sharp. Our added name with initials just is so well done. I really appreciate the quality you receive when you order from Wine Enthusiast. We will always shop with Wine Enthusiast. Recently attended a Bourbon Tasting event and loved the personalized glasses that our host used, so after looking at available options on the internet, chose these... beautiful glasses, and MUCH nicer etching quality than the ones our friend had, I will definitely order more! I purchased a set for my husband as a Christmas Gift and he is very well pleased with them! The Perfect Glass for his single malt scotch! I bought these for a gift. And my whiskey lover friend could believe how much they enhanced the flavor of his favorite drink. Also the last name started with an E and both his wife and him loved the font , said it had been difficult to find a good looking E. The whiskey looks so pretty in the glass I got sent pictures of them using them. I will be ordering these again for sure. It was a very well received Christmas gift, my Boss loves Scotch, and thought it would go well in his bar. I got these for our daughter and son-in-law for Christmas. They are beautiful and a great gift. They loved them. My husband was absolutely thrilled to get these from me for Christmas!!! He loves the shape of the glass and the fact that it has his name on it!!! Awesome product!! Beautiful etching. Arrived early. Great quality. Giving as a gift. Beautiful glasses, arrived in mint condition. They were given as a gift and much appreciated. Would consider ordering again. We very much ch like our glasses. My husband is a Scotch lover, single malt .The glasses were great gift for him. I would certainly recommend them. I will order agAin. Very nice glass and quality. These personalized glasses are beautiful. Great weight , they feel great in your hand. Gift for my wife. She loved them! High quality will make you feel proud as a gifter to anyone! Christmas gift for my hubby and he was super impressed and pleased! Personalizing them with our name took them over the top. Highly recommend this glamorous product! I bought these for my son who is a bourbon drinker.he loved them! An excellent glass to enjoy whiskey. The top is wider than most which allows you to enjoy the aroma of the whiskey throughout the taste. Good quality also is a nice glass for a martini. Purchased another set for my sons birthday. The glasses were a smaller size than I expected, very pretty. They're a wedding gift. The engraving is well done. The glasses are a nice weight. Overall a nice product.